In my family, I'm famous for my delicious chicken rub recipe. I want to share it with you! The brown sugar and spice are a perfect pairing. These wings are sure to be a crowd favorite. Rinse and pat dry chicken, then trim off visible fat. Place chicken in a large pot. Fill pot with cold water until chicken is covered by two inches. Bring water to a boil and boil for 10 minutes. While chicken is boiling, put remaining ingredients in a large Ziploc bag and shake to mix. Set broiler to high with the rack about 6 inches from the flame. Once chicken is done, remove from water and add to Ziploc bag. 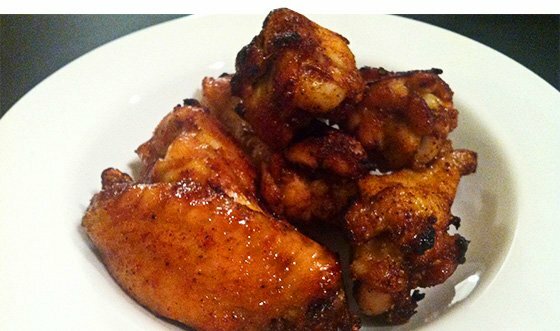 Shake until all wings are fully covered with marinade. Place chicken on a baking sheet and broil for 6 minutes on each side until skin starts to crisp.